More and more businesses are choosing to use recruitment agencies over in-house recruitment due to the increasing difficulty in finding skilled professionals to fill vacancies. There are a myriad of agencies to choose from, and understanding the recruitment process will help you to decide which business to partner with for your recruitment needs. Most agencies either follow a retained recruitment process or a contingent process or a mix of both, and those processes will be very similar no matter which company you decide to work with. As this blog is entitled understanding the executive search process, we will focus more on the retained search process, but first let’s look at all the options open to you. In-house recruitment refers to a division of the HR department who are focused entirely on the on boarding of new employees. Companies who have an internal HR department tend to be mid to large sized with a constant and ongoing hiring need. The other option for businesses with less regular needs, is to outsource recruitment via an agency. In simplistic terms, recruitment agencies can be broken into two distinct types. Retained and contingent. Retained search is carried out by high-end executive search firms who get a retainer (up-front fee) to perform a specific search. This is usually for a senior or critical business role, with the search firm working on that role exclusively. Contingent recruitment (sometimes called non-exclusive) means that the recruiter is competing on the role either with other agencies or indeed the client, should the client have advertised the role on a job board or their website. The recruiter will only get paid should they successfully fill the role, and is often considered to be a more slapdash approach, with the focus on getting as many candidates as possible in front of the employer, whether they have the right skills and experience or not. Executive Search (Headhunting or Retained Search) is used to find the most suitable professional for a specific role whether they are openly looking for a new challenge or not. Whether they are openly on the jobs market is the main difference between contingent 'recruitment consultants' and executive search agents. 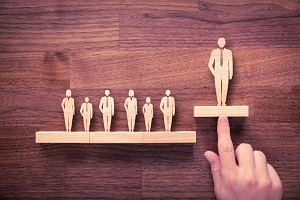 Executive Search professionals look for the best individual for the role and approach them directly, rather than waiting for them to approach the recruiter. It is very common for the most suitable individual to already have a role, so it's a case of finding them. As such executive search firms target the “grey area” of the market i.e. people who are not actively looking for jobs but when presented with an opportunity may move. This opens up a huge pool of candidates, particularly where the executive search firm specialises within your sector and has an established network. 1/3rd when the search begins. 1/3rd when the shortlist is complete. This can put some employers off, but as we have proved in our recent white paper, Proving the ROI of your recruitment strategy, is actually a much more cost effective way of filling roles, particularly if they are senior and/or business critical. The first step is for the retained search firm to meet with the hiring manager and other stakeholders to understand the vacancy, the business objectives, and the person specification. These meetings enable the search firm to gather important information about the requirements of the role, from which they develop an assignment brief. This also gives the search firm the opportunity to witness the company culture first hand, which will help them in their search for the right candidate. The retained search firm drafts their understanding of the position, detailing the candidate specification and the role’s reporting relationships, responsibilities, and objectives. The candidate specification details core competencies, preferred experience and the personal qualities sought in the ideal candidate. This clear outline, agreed with the employer early on in the search process, ensures that the search is correctly targeted, stays on track throughout, and also forms the basis for the job advertisement. The document is also used to market the role to identified candidates. At this stage, the preferred approach will be discussed and agreed, including companies or individuals the employer does want to target and businesses or individuals they want to exclude from the search. The search consultant will then go away and formulate their search strategy. The strategy considers the level and scope of comparable roles as well as other key factors such as location, corporate culture, and salary. At this stage, if they foresee problems with meeting the criteria of the vacancy presented, for example, the experience level requested is not inline with the salary being offered, then they will make the employer aware and suggest ways to adapt the vacancy to make it more attractive. Often, a retained search firm will specialise in a particular area which means they have excellent knowledge of pay rates for different roles, and also have an existing network, and know where to look for suitable candidates. Initially, a list of potential targets will be drawn up using social media searches, knowledge of existing networks and contacts, and other sources, the key thing being that these aren’t necessarily candidates that can be found on a job board. The search firm will then fully screen all potential candidates to ensure they meet the criteria of the role, understand their motivations and likelihood to consider a move, and provide regular search updates to the client throughout. Once selected candidates have been fully evaluated against the candidate specification through in-depth, in-person or video-conference interviews, taking great care to maintain confidentiality, a final shortlist will be delivered to the employer for their consideration and for second stage interviews. This is done using a candidate profile which summarises the candidate’s education, career history and current situation, and which includes the consultant’s assessment of their strengths and weaknesses. All of this can take a lot of time, and a good executive search firm will be adept at maintaining communications with candidates of interest to ensure they remain engaged in the process. Once interviews are lined up, and the employer has met with the final short list, the search firm will work to gather references and communicate back to any unsuccessful candidates. When a final candidate is selected, the search consultant works closely with the client and candidate to position the offer in a way that makes it attractive, and negotiates a package that is agreeable to both parties. The search is considered closed when the candidate accepts the offer, agreeing to join the company. We mentioned earlier that retained executive search processes tend to be very similar no matter whether you choose to work with a large well known firm or a smaller, more niche agency. So how do you choose the agency that’s right for you and your business? The best retained search agencies will offer you reassurances of their level of service, whether that be existing client and candidate testimonials, ISO quality assurances or membership to well-regarded recruitment associations such as APSCo. In addition, the best firms will have confidence in their level of service and as such will offer a replacement guarantee if for any reason beyond redundancy, the chosen candidate does not stay with the business for a specified time period. They will also stay in touch to ensure a smooth transition, monitor progress and to follow up with you on your experiences of the process and ultimately the results being delivered, which if done right, should surpass your expectations and previous experiences using other recruitment methods. For more information on Newman Stewart’s executive search process, take a look at our corporate brochure.